Russian Gazprom, Lukoil, and Rosneft entered the list of 90 companies in the world, which are "responsible" for climate change. Researchers studied the world largest "pollutants" of the environment with emissions of CO2 and methane in the last 260 years. The report was prepared by the Climate Mitigation Service (USA) with the support of Climate Justice, Friends of the Earth, Greenpeace International, and the Union of Concerned Scientists. Researchers have spent eight years on the analysis of publicly available statistical data on emissions, as well as the data from the Center for Information and Analysis of Carbon Dioxide with the U.S. State Department. They also took into account the merging, acquisitions, change of ownership in companies that have taken place over the past centuries, to avoid double counting. In the ranking of countries, the absolute leader in the combined emissions of CO2 and methane was the former Soviet Union: it accounted for 8.94 % of emissions (its "leadership" was provided by coal and oil and gas industries). China took the second place in the table with 8.56 %, with the largest contribution to emissions made by coal and cement industries. Among the main culprits for greenhouse gas emissions over the last 260 years ( from 1751 to 2010) were primarily private and public oil and gas companies, including American Chevron (3,52 % of total emissions), ExxonMobil (3,22 %), ConocoPhiilips (1,16 %), British BP (2,47 %), Chinese PetroChina (0,73 %), the Royal Dutch/Shell (2,12 %), as well as Saudi Aramco (3,17 %). Russian Gazprom is responsible for 2.22 % of total emissions, Lukoil – for 0.27 %, the former Yukos - for 0.20 %, and Rosneft - for 0.19 %. As it turned out, a third of global emissions was produced by only 20 major private and public companies, with Gazprom being the fifth in the list. The study authors write: "When we start counting emissions not by countries, but by the twenty largest companies, our evaluation of greenhouse gas emissions is beginning to change: Thus, several dozen specific institutions whose heads could very well fit in one bus come to the foreground instead of 7 billion people and 200 countries." Earlier, the report of the Earth Focus Foundation also included made similar conclusions, including the Russian Gazprom in the top twenty "producers" of greenhouse gases in the world. 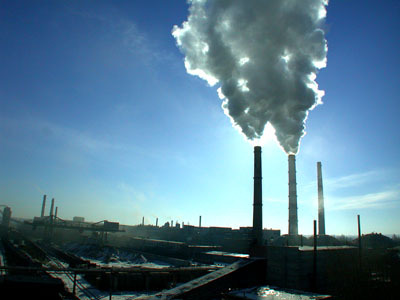 The List of Earth Focus Private Sector Carbon Emissions gave it the fourth place among 347 pollutants. According to the report, the top twenty companies included in the list account for 58 % of total global emissions. The authors of the Earth Focus Foundation report went a little further in their research and considered efforts and prospects of big business to reduce greenhouse gases. As the data comparison results show, from 2010 to 2011, 129 companies had found the possibility of reducing emissions, and 162 companies did not reduce or increased them. Importantly, the Russian gas giant has repeatedly stated on implementation of voluntary mechanisms of environmental responsibility. The report on the results of consideration of environmental policy states that the company reduced its greenhouse gas emissions by 3.8 million tons in 2011 as compared with the previous year, within the program of energy conservation and energy efficiency. Unfortunately, the loss of access of Russian business to the Kyoto mechanisms will likely tell not the best way on the pace of introduction of new climate-friendly technologies in the country, and hence on national emission targets. It is obvious that private companies are much more sensitive to market conditions and the global environmental and economic trends. Hopefully, Russian companies will still be able to find the motives and opportunities for green development.